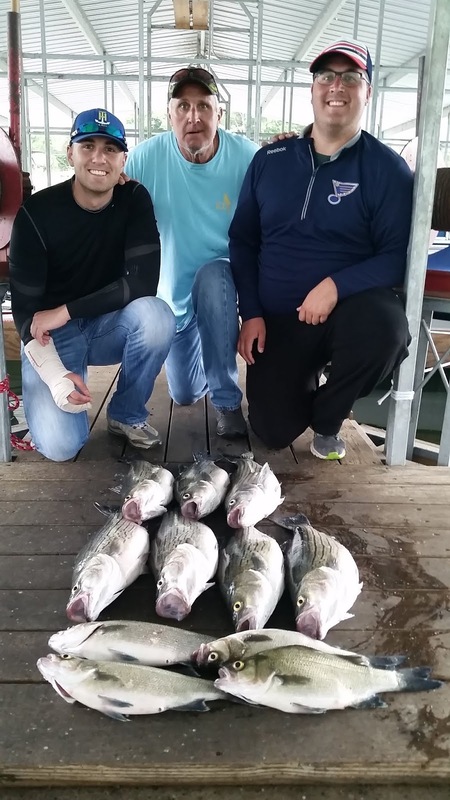 Norfork Lake fishing has been consistently good for the last several weeks. Of course, as you would expect there are times that one day is better than the other. I expect the strong bite to continue throughout August, assuming the weather patterns and the lake levels hold fairly stable. The bite for striped bass and hybrid bass has been excellent. 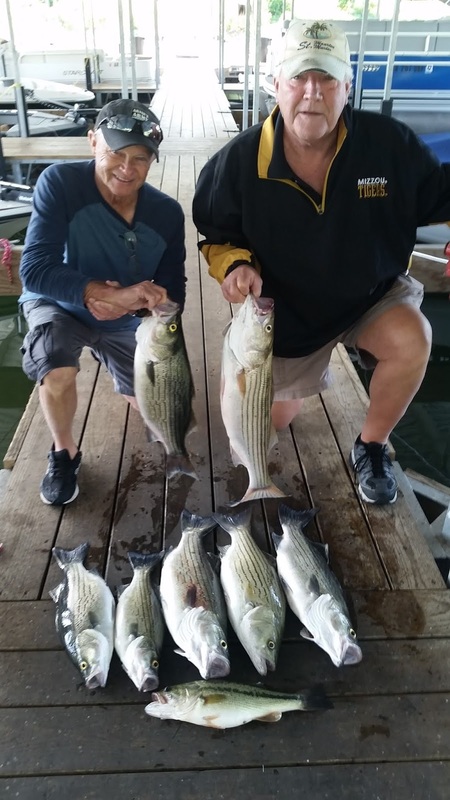 I am finding striped bass and hybrid bass schooled up in deep water (60 to 80 feet) and the fish are typically suspended 30 - 50 feet down. I have also found some big stripers and hybrids in 35 - 50 feet of water. These fish are 30 feet to the bottom. I have had the best luck with deep water fish before it gets light out in the morning, from about 5AM to about 7AM. The fish are being found on bluff line points, but not necessarily in the main lake. At around 7AM I move to a shallower bank, still not main lake that is holding a lot of bait. I am finding large schools of whites, hybrids, and stripers feeding heavily on shad and this has lasted until around 8:30 when they tend to disappear. The timing has been great for me as I need to head back to work at Hummingbird Hideaway Resort. Fishing is part of my job description, since I need to be able to help my guests find and catch fish. Tough job, but someone needs to do it. :-) I have been fishing 2 methods, live bait in the dark, then I switch to a spoon and start to vertical jig. Live bait will work great all the time, but I enjoy spooning for fish. Best locations for striped and hybrid bass are from around Point 2 down and a little past the Jordan area, as well as, by the dam. Look at secondary points back in the creeks and larger coves, but they do move to the main lake points at times. This is a large area, but there are lots of fish at many different locations at this time. Topwater action is still occurring in the mornings as the sun is starting to rise and can occur at any time of the day anywhere in the lake. Sunrise and sunset is still the best time for topwater action. In the area where I am fishing for striped bass the fish start to chase shad on the surface as the sun comes up. I have caught spotted bass, largemouth, whites and hybrids on a Zara Spook over the last couple of weeks. Large schools of whites are erupting from the 101 bridge to Cranfield Island and also up to the Red Bank area. Once you find the school creating white water, cast your favorite topwater bait or a blade type bait, such as a Kastmaster, into the active fish and hang on. It is a blast catching one fish after another. The walleye bite is still good. The walleye I have found has been in 35 - 50 feet of water on the bottom. 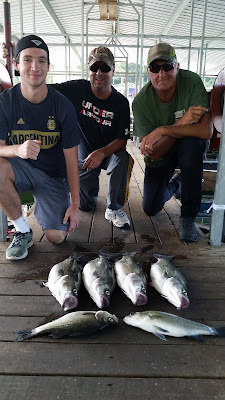 I caught fish on a spoon, vertical jigging it off of the bottom. Troll a crank bait with lead core line, downriggers or inline weights in order to get your bait down to 30 - 40 feet of water. Troll along bluff lines, or large flats. You can also find walleye hanging around brush piles in 25 - 40 feet of water. Live bait or spooning will work around the brush. You can also use a crawler harness with a blade and a bottom bouncing weight to catch some nice fish. Some of the best colors of blades are chartreuse and orange. 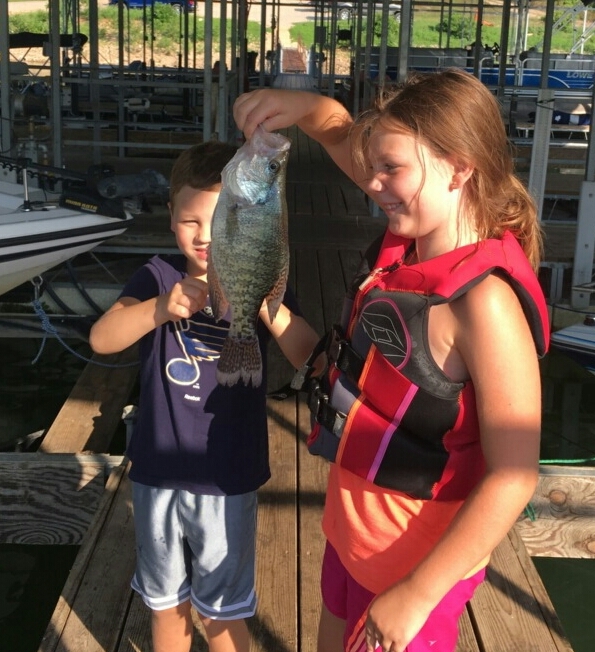 Crappie are scattered at this time and are being picked up while trolling for walleye. 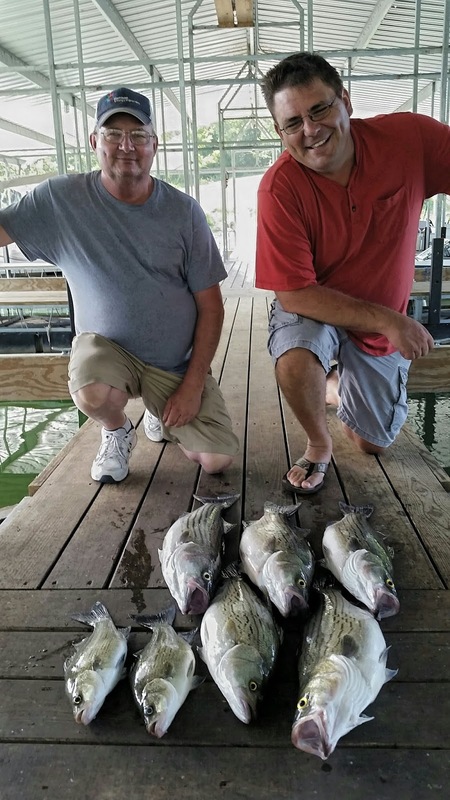 Some crappie are hanging around brush piles in the 30 feet range and can be caught on jigs or live bait. Norfork Lake level is dropping very slowly and currently sits at 553.12. The lake surface water temperature has dropped from my last report and ranges from 84 to 87 degrees depending on your location and time of day. The main lake is clear and the some creeks and coves are stained.